Toyota Motor set a first half U.S. sales record for light trucks with a 15-percent gain in June. U.S. light-vehicle sales dropped 2.9 percent in June behind another weak month for cars and lower fleet shipments. Toyota, Nissan and Honda chalked up modest June gains while the Detroit 3 slipped as the industry posted its sixth straight monthly decline. The advances at the biggest Japanese companies were all in the low single-digit range, fueled largely by truck sales. Ford retreated 5.1 percent after posting its first sales gain of the year in May. General Motors deliveries fell 4.7 percent while continuing to point to a reduction in lower-profit sales to daily rental fleets. Fiat Chrysler was down 7 percent. As has been the case throughout the year, the results were marked by steep declines in car sales -- down 14 percent for the month -- even amid rising incentives. Truck deliveries edged up 4.2 percent in June. The seasonally adjusted, annualized sales rate came in at 16.54 million, the lowest pace of sales of the year and slightly below the 16.6 million average estimate of analysts polled by Bloomberg. June marked the fourth straight month the SAAR has dropped below 17 million after six straight months above that threshold, including 18.38 million in December. U.S. light-vehicles sales are now down 2.1 percent for the year. The downturn follows seven consecutive years of rising demand, including records in 2015 and 2016. Volume rose 2.1 percent at Toyota Motor behind a 3.2 percent gain at the Toyota Division, offsetting a 5.4 percent dip at Lexus. It was the ninth straight monthly decline for Lexus. Nissan said June deliveries rose 2 percent, with volume up 1.2 percent at the Nissan brand and 11 percent at Infiniti. At GM, volume was off 6.4 percent at Chevrolet, 3.6 percent at GMC and 12 percent at Cadillac. Buick, behind demand for the new Envision crossover, saw sales rise 16 percent. GM's sales have now dropped four out of six months this year. GM said June daily rental fleet shipments dropped by 11,000 vehicles, or 54 percent, over June 2016. Ford Motor sales were dragged down by a 23 percent drop in car volume. Ford said its pickup and van sales rose 1.2 percent while SUV and crossover demand rose 3.2 percent. Deliveries dropped 5.4 percent at the Ford Division and rose 5.3 percent at Lincoln. At Honda, deliveries edged up 0.8 percent behind record truck volume. Sales slipped 1.3 percent at the Honda Division but jumped 24 percent at Acura. Truck deliveries rose 1.9 percent to a June record of 70,067, with volume surging 31 percent at Acura. The company cited "inventory issues" for a 1.6 percent drop in truck volume at the Honda brand. Overall, American Honda's car sales slipped 0.3 percent last month. "Against a sea of competitors clinging to market share via heavy incentives and fleet sales, Honda's success is driven by retail customers attracted to a cadence of strong new products," said Honda’s Conrad. Fiat Chrysler volume dropped 7 percent, with every brand but Ram posting a decline. It was the company's 10th straight monthly decline year over year. FCA reported U.S. retail sales dipped 5 percent to 139,947 units last month while fleet deliveries dropped 15 percent to 47,401. The largest planned volume reduction in June fleet sales came at the Jeep brand, where fleet volume skidded 49 percent year over year. FCA said fleet sales represented 25 percent of its June deliveries. At other brands, volume rose 12 percent at Subaru and 15 percent at the VW brand, but slipped 15 percent at Mazda, 5 percent at Mitsubishi and 10 percent at Mini. Among other luxury brands, volume rose 0.4 percent at BMW, 1.7 percent at Mercedes-Benz, 5.3 percent at Audi, 1 percent at Land Rover and 7.4 percent at Jaguar, while sales dropped 15 percent at Volvo. The number of selling days last month -- 26 -- was the same as June 2016. Ahead of Monday's reports, among major automakers, only Toyota, Honda and Volkswagen Group were forecast to post higher sales in June, according to analysts polled by Bloomberg. The steepest drops in volume were expected to be posted by Fiat Chrysler, Ford and GM. 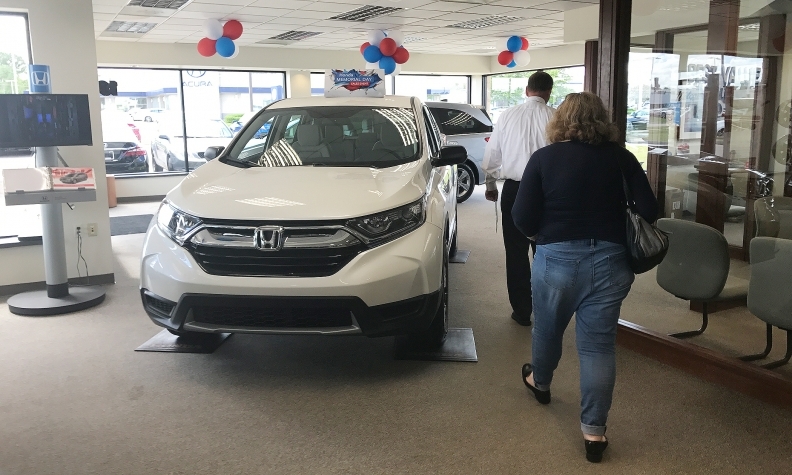 Honda said U.S. sales of the CR-V suffered slightly in June from low supplies of higher trim levels, but the HR-V set another record with its best June and the Ridgeline pickup posted double-digit gains, despite inventory issues with all-wheel drive models. 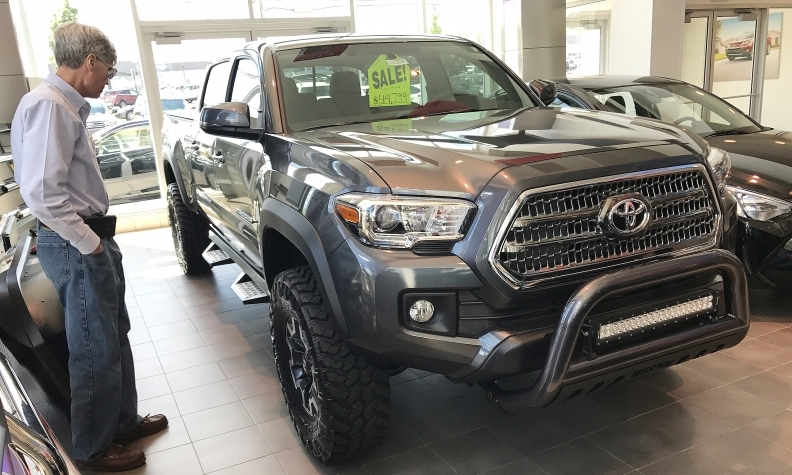 “While six straight months of sales declines sounds troubling, June is sandwiched between two major holiday sales events, which makes it a bit of a gloomy month historically,” Edmunds.com analyst Jessica Caldwell said. With inventories growing and demand weakening, automakers are cutting output and sweetening deals. J.D. Power says June new-car incentives averaged $3,955, up $249, while truck deal discounts averaged $3,494, up $350. A rise in used-vehicle supplies spurred mostly by off-lease cars and some light trucks, lower fleet shipments and slowing retail demand have undermined volume this year. Retail demand, a better measure of the industry's financial health, is down less than 1 percent from 2016’s record levels. June fleet sales are expected to drop 20 percent at GM and 15 percent at Ford, according to estimates from JPMorgan Chase & Co. analyst Ryan Brinkman. The estimated average transaction price for light vehicles in the U.S. was $34,442 in June 2017, Kelley Blue Book estimates. New-vehicle prices have increased by $511, or 1.5 percent, from June 2016, while remaining relatively flat, down 0.1 percent, from last month. Edmunds.com reported the average monthly payment on a new car or light truck has jumped above $500, forcing many buyers to stretch wallets and purses more than ever. The consumer shopping site estimates the average length of a new-vehicle loan hit a record 69.3 months in June, with the average amount of financing hitting $30,945, an increase of $631 from May. Morgan Stanley analyst Adam Jonas says the U.S. new-vehicle market is entering a period of an “eroding plateau,” when the SAAR remains at healthy levels but overall monthly unit volume continues to decline or remain flat year over year.